I also call this “skinny” plaid. I need to brush up on my plaid-terminology maybe. This shirt is blue with very thin plaid on it that is mostly dark grey with tiny accents of red. It’s a rare button-up for Sam, with white buttons. It has a nearly invisible left breast pocket with an eagle embroidered on it. In In The Beginning (4x03), Sam is wearing this shirt as he slips out the door at the beginning of the episode. Sam wears it during the Summer of 2008, when Ruby arrives wearing coma-girl, as we see in the flashbacks in I Know What You Did Last Summer (4x09). In Sam, Interrupted (5x11), Sam wears it to the interview at the psychiatric hospital. He changes into scrubs after he is admitted. In Weekend at Bobby’s (6x04), Sam is wearing this shirt when Bobby yells at the boys for being selfish. In Live Free or Twi-Hard (6x05), Sam wears this shirt from the morning he calls Samuel, speculating about the vampires, until they cure Dean of vampirism. In Adventures in Babysitting (7x11), Sam is wearing this shirt when Crissy calls Bobby’s phone. 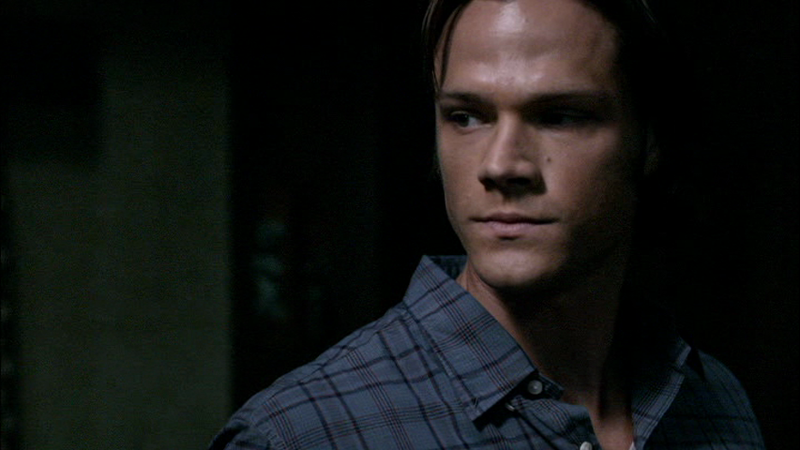 Sam wears the shirt until Dean and Crissy rescue him from the Vitalas. 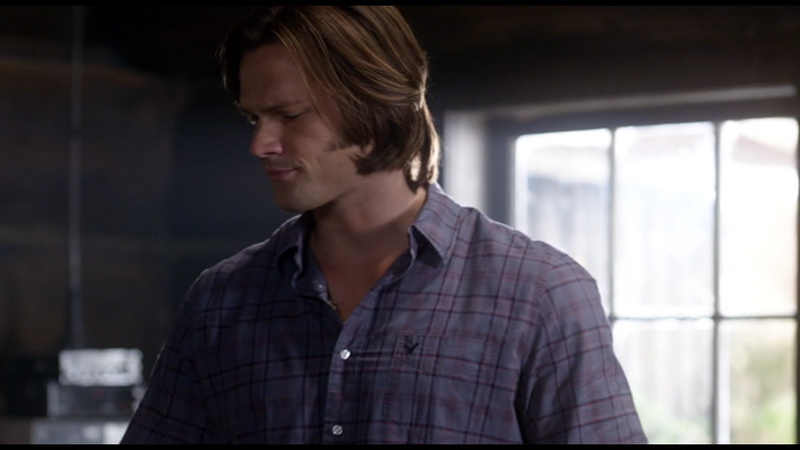 In Plush (11x07), Sam wears this shirt after he changes out of his suit and he and Dean go to Rita’s house for a second time to confront her, after finding out she withheld information about her brother. He keeps it on for the rest of the episode. In The British Invasion (12x17), Sam wears this shirt when Eileen comes over and tells them that she tracked down Kelly Kline. FATE: In Sam, Interrupted (5x11), Sam is forced to wear scrubs once he is admitted to the hospital. When he escapes, he is still wearing scrubs – one has to wonder what became of his clothes.